Oh, that (in)famous Detroit Red Wings defense. In what was a disastrous year for the Red Wings, their team defense certainly accounted for most of the blame. With no true, top-pairing blueliners on the roster—but plenty of past-their-prime veterans—Detroit’s defense was a sore spot for the struggling franchise. Part of Detroit’s conundrum can be traced back to their failure to draft and develop quality defensemen – goalies too, but that wasn’t the issue. Former high picks Brendan Smith, Jakub Kindl, Ryan Sproul, and Xavier Ouellet did not transform into the quality defenders that Detroit had envisioned. As a result, they’ve had to rely on free agents, veterans, and depth draft picks to form three underwhelming pairings. However, hope is on the way. Top prospects Dennis Cholowski, Joe Hicketts, Filip Hronek, Vili Saarijarvi, Libor Sulak, and potentially a top-eight selection from the 2018 NHL Draft will be pushing for roster spots soon. With these prospects knocking on the door, the defensemen presently on the roster will need to step up their game or they’ll find themselves on another team – or out of the league. Like last year’s grades, Detroit’s defensemen and goalies will be evaluated on their output, role execution, and how they grew compared to last year and throughout the season. And like the forwards this year, the blueliners’ individual Offensive Efficiency Rating (OER) and Defensive Efficiency Rating (DER) will be included to view what tended to happen when they were on the ice. Below are the grades, stats, and evaluation notes for the nine blueliners to suit up for the Red Wings this season. For Trevor Daley and Detroit’s other blueliners, one thing was consistent: Below-average defending and far too many shots against. Their inability to effectively transition play out of their own zone led to more shots and goals against. But for Daley, he was able to keep up offensively. His nine goals led the team and the veteran was on the ice for more even-strength goals for than any other Red Wings defenseman (53). On the flip side, Daley and Dylan Larkin were on the ice for 63 even-strength goals against – most on the team. It was a tale of two seasons for Danny DeKeyser. The former undrafted free agent had an abysmal start to the season, but kicked his game into gear following the All-Star Break. 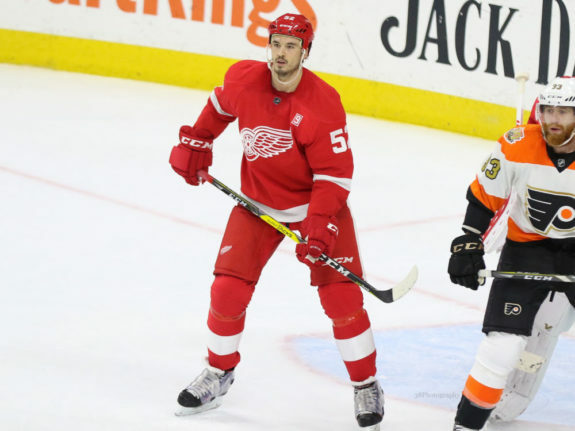 Penalty kill struggles aside, DeKeyser was one of Detroit’s most reliable defensemen in the second half, even when the team endured its longest losing streak in a generation. As general manager Ken Holland continues to drive the organization’s rebuild, he’ll be looking to deal off some veterans to make room for the top defensive prospects mentioned above. DeKeyser’s contract would be tough for another team to swallow, but wouldn’t be impossible to trade, especially if salary is retained. He’ll need to play a more consistent game next season to survive the rebuild. Throughout the season, Jonathan Ericsson was tasked with going up against opponents’ top lines alongside Trevor Daley. It was a mixed bag for the veteran, but, all things considered, he wasn’t terrible in that role. Ideally, though, he’s a third-pairing defenseman. That’s just where Detroit’s defense stands. While Ericsson did show some aggression throughout the year, he still needs to work on clearing out opponents (and pucks) from the net-front while shorthanded. Ericsson also has a cannon for a shot if he can put it on net, but he often deferred to passing it elsewhere or took too long to get his shot off. 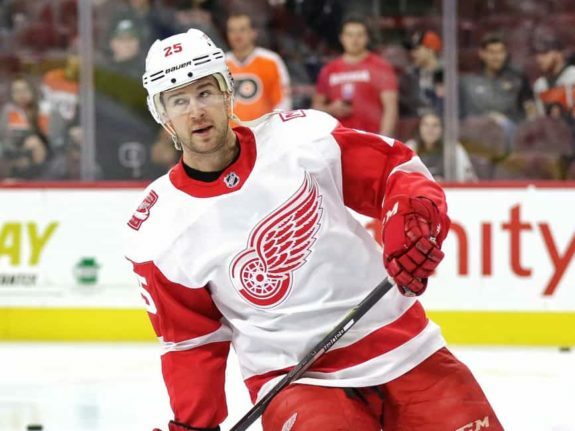 At the beginning of the season, Mike Green’s offensive output had Red Wings fans licking their chops at the potential return if the veteran was dealt at the trade deadline. However, his year went downhill from there. Green’s production tailed off, his defensive woes continued, and, finally, he got hurt just before the deadline. It was no fault of his own – just bad luck for the Red Wings as they rebuild. It’s possible that Detroit signs Green to a one- or two-year extension, but that would also mean taking a roster spot away from a prospect. However, a one-year deal that leads to a successful trade deadline swap would be tolerable, especially if one or two other defensemen are moved this offseason. If Hicketts played more than five games and maintained his performance, the young defenseman would have easily earned an ‘A’ for the season. He’ll be in Detroit full-time next year, as the blueliner will need waivers to be sent down to Grand Rapids. There was interest in Nick Jensen at the 2017 NHL Trade Deadline, but Detroit opted to hold onto the fleet-footed defenseman. Jensen’s speed, willingness to jump into the play, and quick decision-making could attract a few trade offers once against this offseason if Holland makes him available. Overall, Jensen is a solid third-pairing defenseman with some offensive upside. His 14 even-strength assists led all Detroit blueliners, though that’s not a high number when compared with the rest of the NHL. There were just too many goals against while Jensen was on the ice, whether that was at even strength or on the penalty kill. For someone playing on one leg and suiting up for all but the first three games, Niklas Kronwall certainly ended the year strong. The veteran’s six-game point streak capped off his best offensive season under Jeff Blashill’s watch. Kronwall is aiming to come back next season – the final year of the contract he signed way back in 2011. His locker room presence is valued within the organization, even if his on-ice play diminishes. 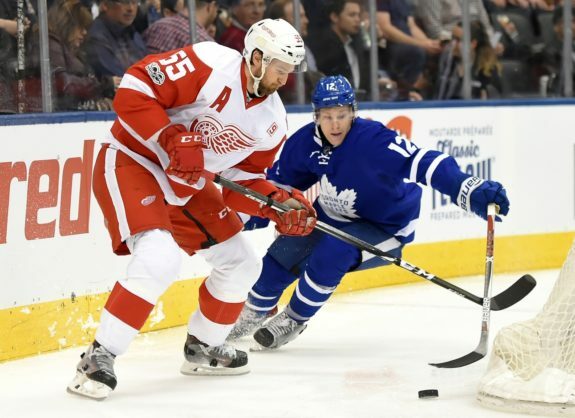 While Detroit rebuilds and brings in younger players, Kronwall’s experience and leadership will go a long way in teaching prospects the right way to prepare and compete at the NHL level. In his only game of the season, Brian Lashoff played just over four minutes and did not allow a goal while he was on the ice. The minor league veteran does not factor into Detroit’s future plans. When Xavier Ouellet was in the lineup, it was clear that his confidence was shot. And because of Detroit’s logjam on defense, Ouellet could not get on a roll to solidify his spot in the lineup. If the defenseman gets his wish, he’ll be with another organization next season where he’ll be able to play most nights. That, or in Grand Rapids if the Red Wings choose to waive him. Detroit’s goalies were graded based on their individual play—independent of the much-maligned defense—including their positioning, rebound control, and other aspects of their game. 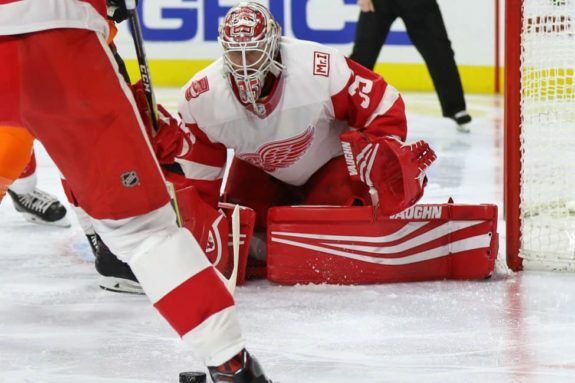 The stats say it all: Jared Coreau did not have a good few games for the Red Wings. Yes, the defense around him was not reliable, but Coreau failed to track the play well. He did not adjust to NHL game speed and often committed to the shooter way too early, leaving open net for other attacking players. 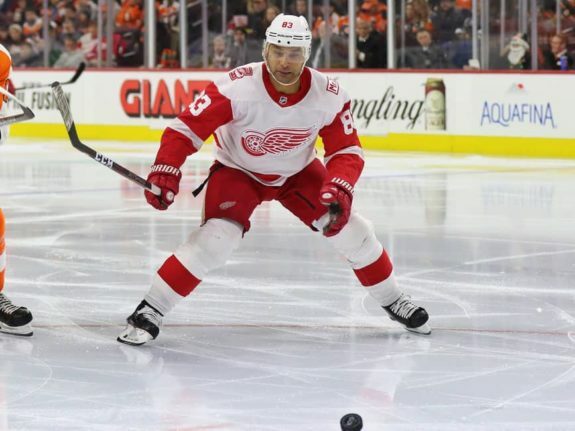 It’s unlikely that he’ll be back with the Red Wings next season, though a return to Grand Rapids is not out of the question. Prior to Christmas Break, Jimmy Howard was performing like an all-star for the Red Wings. His skating was the best it’s ever been and he gave Detroit an opportunity to win every night. Howard was absolutely dialed in. However, all good things come to an end. Before he was traded, Petr Mrazek supplanted Howard as the starter with stellar play, while the veteran faltered in his opportunities. Furthermore, the long-time Red Wings netminder just looked shell-shocked in the second half from all of the shots he had faced throughout the campaign. Considering 60 games is the most Howard has played since the 2010-11 season, it’s understandable that he was a little worn out at the end of the year. Detroit will need to find a backup capable of playing 30 games for next season’s team to keep Howard fresh. 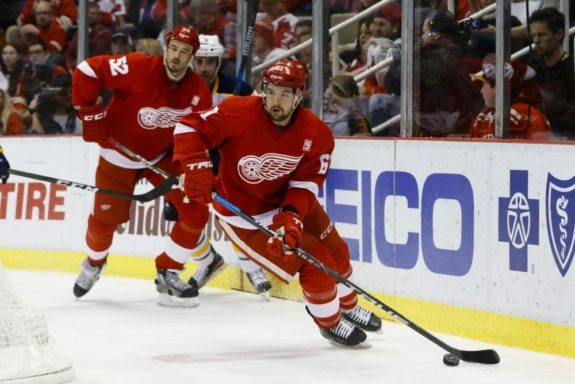 How would you grade the the defensemen and goalies from the Detroit Red Wings? Comment below with your thoughts.